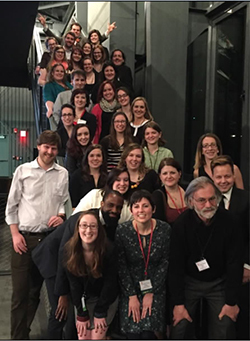 The Museum Association of New York (MANY) held its annual meeting at the Corning Museum of Glass and the Rockwell Museum in Corning April 12 -14. Current students and alumni from the University’s graduate Program in Museum Studies were well represented by 26 graduate and undergraduate students currently enrolled in museum studies courses. Six members of the faculty also attended, including Edward Aiken, Emily Dittman, Dana Krueger, Emily Stokes-Rees, Andrew Saluti and Miranda Traudt. Dittman and Saluti, both from the Syracuse University Art Galleries (SUAG), presented the session “Marketing Your Collection: Creating a Successful Traveling Exhibition.” The two also received an award from MANY on behalf of the SUAG in recognition of the SUAG’s recent expansion, which makes far more objects from the collection available to the public. Saluti also became a member of the MANY board. Students from the program served as volunteer staff and four of them—Jennifer Peters, Michelle Reynolds, Desirae Salswedel and Amanda Sterling—gave poster sessions ranging from “Museum Education” to “Collections Management.” In addition, the Rockwell Museum hosted student projects developed in the “Public Learning in Museums” course taught by Krueger.